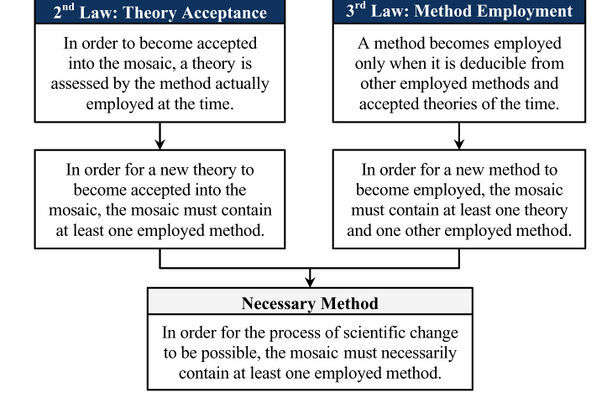 An attempt to answer the question of Necessary Methods which states "In order for the process of scientific change to be possible, the mosaic must necessarily contain at least one employed method." Necessary Method theorem was formulated by Hakob Barseghyan in 2015.1 It is currently accepted by Scientonomy community as the best available theory on the subject. Insofar as necessary methods go, the philosophy of science was initially not very concerned with this subject. Philosophers like the logical positivists, Karl Popper, and all those up until Thomas Kuhn held the general tacit belief that there was a singular method of science and that all scientific communities would abide by it. This method was inherently necessary because science was exclusively a function of it; to believe otherwise would imply irrationality in science. For example, with Popper, theories were accepted on a basis of falsification and corroborated content.2 During this time, anything accepted without a method of acceptance was simply unscientific. However, with the arrival of Kuhn and the fluidity of methods, the necessity of methods could finally come into question – though not specifically by him. Kuhn posited periods of normal science, which followed a certain method, but were eventually overtaken by anomalies and faced scientific revolutions. After a scientific revolution everything would be overturned and a new method would be taken on within the period of normal science. 3pp. 62-76Albeit Kuhn did not consider the necessity of methods discretely, it would seem in his formulations he determined a strict structure including methods. Therein, it would be fair to conclude he would have believed methods to be necessary. Additionally, Kuhn’s ideas gave rise to similar formulations by authors such as Imre Lakatos. Like Kuhn, Lakatos believed there were several paradigms in scientific communities throughout history. Unlike Kuhn, Lakatos stipulated theories must be assessed holistically and with a singular method. Additionally, he posited there were many research programmes which were at war with each other instead of just a single paradigm. Theories were judged to be regressive or progressive via a fitting criterion which we can interpret as Lakatos’ method.4pp. 31-34 Once again, we see the acceptance of the necessity of methods within the community of the philosophy of science. Generally, it is not until the likes of Paul Feyerabend at which point the necessity of methods is rejected. However, very few philosophers of science to this day hold this view. Necessary Method theorem (Barseghyan-2015) is an attempt to answer the following question: Are there methods that are necessarily part of any mosaic? See Necessary Methods for more details. To better illustrate this example, we can imagine a community with a set of accepted propositions. Community φ accepts proposition α. For α to have become accepted, through the second law, we know that φ must have had implicit expectations which α satisfied. No matter what those expectations are, if the community had not harbored those expectations there could be no acceptance. Similarly, if we have a community φ which experiences a change of expectations (i.e. a change of method), it is deductively true that φ already had a set of expectations which could be referred to as a method. This page was last modified on 10 March 2018, at 20:46.